Following Kevin Feige confirming the release of the trailer by year's end, now a new rumor offers the title, "Annihilation," again, as well as the release and music. 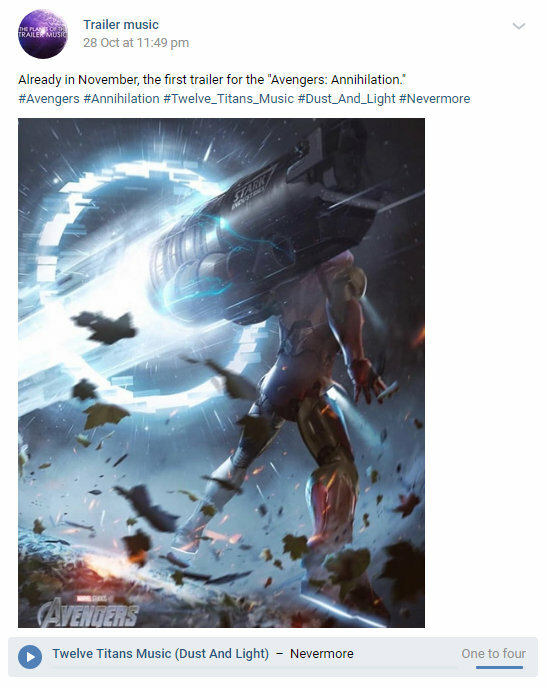 The Russian site VK.com has it that The Avengers: Annihilation is the title, that the trailer will be released in November, and that it will be using the song "Dust And Light" from The Hobbit: The Battle of The Five Armies. While it's unknown if the info is legit, obviously the use of "Dust and Light" would be rather fitting considering what happened at the end of Infinity War. A possible description for The Avengers 4 trailer has leaked online, which actually sounds as if Marvel won't be revealing too many spoilery details. What remains to be seen is if any of these "leaks" are actually true, as some could be intentionally released by Marvel to sway fans from what's actually going on. Case in point would be the use of the Hulk in the Infinity War trailers, but he wasn't featured in the movie. Just recently also saw Mark Ruffalo tease the reveal of The Avengers 4 title, but didn't. "We have seen so much content that every average moviegoer has a level of sophistication in their ability to predict what is going to happen in a movie, which is why Anthony and I spent a lot of time trying to hide the secrets of [Avengers: Infinity War], misdirect the way the trailers were cut, misdirect with information. It’s too easy for them to intuit what is going to happen," director Joe Russo said following the release of Infinity War. The Avengers 4 has a May 3, 2019 release directed by Joe and Anthony Russo and stars Robert Downey Jr., Josh Brolin, Chris Evans, Chris Hemsworth, Scarlett Johansson, Mark Ruffalo, Jeremy Renner, Karen Gillan, Bradley Cooper, Chris Pratt, Zoe Saldana, Dave Bautista, Tom Holland, Benedict Cumberbatch, Paul Rudd, Evangeline Lilly, Sebastian Stan, Chadwick Boseman, Don Cheadle, Danai Gurira, Letitia Wright and Brie Larson. The movie is a sequel to Infinity War where the Great Titan left the universe in shambles by killing off half the population including the Avengers. Now Marvel's super heroes must suit up perhaps one last time to make things right by taking down Thanos once and for all.